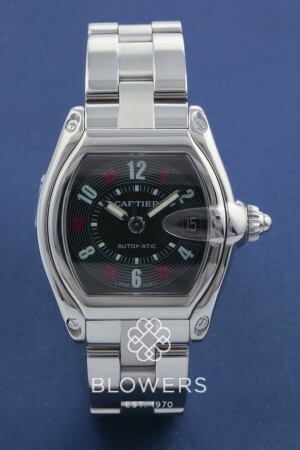 Cartier Gents Steel Roadster. Automatic movement. Black dial with white Arabic numeral markers and silver centre with date display. 44.3 x 38.9mm case. Steel bracelet with inter-changeable leather straps. Box and service papers dated June 2014. Our reference S21786. SKU: 3012107. Categories: Cartier, Roadster.